Testing for BRCA1 and BRCA2 mutations in breast cancer patients is used to identify the risk of second primary cancers and the risk of cancer in the patients’ family. Women with triple-negative breast cancer (TNBC) are thought to be more likely to be BRCA1/2 mutation carriers, but most national guidelines for genetic testing, including those used in Germany and Austria, do not consider receptor triple negativity. 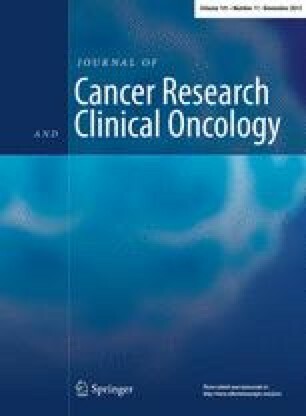 We determined the prevalence of BRCA1 and BRCA2 mutations within a cohort of 100 unselected TNBC cases, including patients from Germany and Austria to identify those BRCA-positive patients with a masked family history and who would have been missed due to respective current national guidelines. Double-stranded Sanger sequencing of all exons of BRCA1 and BRCA2, respectively, was performed. We identified a total of 13 deleterious mutations in BRCA1 and a total of four deleterious mutations in BRCA2. The total rate of deleterious BRCA1/2 mutation carriers was 21 % in our cohort. Six novel mutations, including two deleterious mutations, have been identified, which have not been described in public mutation databases so far. According to current German and Austrian national guidelines for genetic testing, 38.1 and 52.4 %, respectively, of BRCA1/2 mutation carriers would have been overlooked. We conclude that the prevalence of BRCA1 and BRCA2 mutations is high in TNBC patients and that BRCA1/2 mutations are not restricted to young women or patients with a positive family history. Receptor triple negativity should therefore be considered in BRCA1/2 genetic testing guidelines. Axel Muendlein and Bettina H. Rohde are first authors and have contributed equally to this article. Thomas Decker and Alois H. Lang are senior authors and have contributed equally to this article. The online version of this article (doi: 10.1007/s00432-015-1986-2) contains supplementary material, which is available to authorized users. We are grateful to Mag. Gabriela Dür and the Vorarlberger Landesregierung (Bregenz, Austria), to Franz Rauch and the Vorarlberger Industriellenvereinigung (Bregenz, Austria), to Dr. Peter Woess and the Vorarlberger Aerztekammer (Dornbirn, Austria), as well as to Dr. Peter Fraunberger and the Institute for Clinical Chemistry at the Academic Teaching Hospital Feldkirch (Feldkirch, Austria) for continuously supporting our research institute. The present study was partly financed by the European Union’s European Regional Development Fund through the INTERREG IV Programme “Alpenrhein-Bodensee-Hochrhein,” Project Number: 179. All procedures performed in this study involving human participants were in accordance with the ethical standards of the institutional and/or national research committee and with the 1964 Declaration of Helsinki and its later amendments or comparable ethical standards.